No, no one died in real life. Just a player left the game, meaning that his character, Eunike will not be playing with us again. Technically the character is not "dead" as the player can choose to return anytime, but it's unlikely. 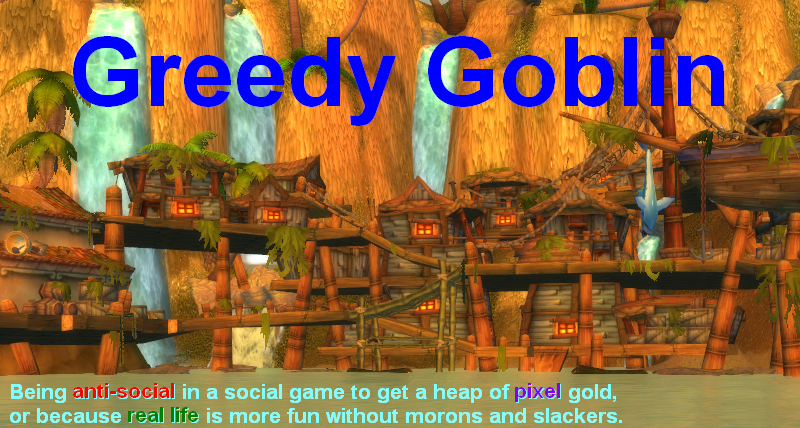 So he put his gold (70K) to the guild bank, donated 40K to a friend, asking me to send him in 5K pieces in 8 weeks. He also sent me lot of stuff to sell and put the gold to the guild bank. As you know, the gold in the bank serves only one purpose, free repairs, so it's pretty equally distributed in the guild. Trying to sell his things isn't easy, despite my experience in buying and selling. He had very different business from me, so I don't know when and how to sell the items. I can just brute force it: scan the AH and trust the addon. I try to sell the epics at the horde as they buy those things more. However, large part of his fortune is not even in my mailbox. It lies with the now inactive character as soulbound stuff. He could reclaim very little of its value by disenchanting or vendoring. This reminded me handling the stuff of a deceased family member. No, she wasn't that close, I helped the close relative. There I found the same: most of the stuff she had were "soulbound", things that worth a lot to her, but nothing to the surviving relatives. Not even emotional value, as they were simple "gear". Clothes, medicine, furniture, things we all need and use but can't really pass on. One could say death is the biggest destroyer of material value, devaluing lot of items into rubbish in a second. However it's not true. The item is just the same as it was when its owner lived. The value destroyer is "soulbounding". "Bind when equipped" or even "bind on pick-up" is very common in real life too. The shirt in the shop may worth $50. If you buy it, even if you don't open the package, you can only sell in a second hand shop for about half of it. If you wear it, just once, even the second hand shop will give you less than $10. The solution, both ingame and real life is "simple": don't buy stuff that you don't use soon. Later you can't un-soulbound it, and neither you, nor the ones who inherit it can use it. And herin lies the dilema of our modern consumer society. Our whole global economy is based on ever increasing consumption while faced with ever decreasing natural resources and increasing populations. If consumers reduce their consumption the economy declines. For the last 3 years my own personal choice has been to adopt a minimalist way of thinking and consuming. Life is a lot calmer, cheaper and simpler without all the mess and clutter of useless junk that seemed like a good idea in the shop! With no personal debt and healthy savings now I can do so many more fun things than before. I'm not sure how the economy would fare if more people were like myself and other minimalists!? I am reminded of a scene from 8-bit theater comic strip, where Red Mage complains that every time he uses a spell from his book, he loses versatility. I am also reminded of myself hoarding every single consumable in single-player RPGs on the grounds of "if i use it it will be gone forever! ", which resulted in most of my playthroughs ending up as self-imposed "no Item command" challenges. The point i'm getting at is that soul-binding is equal to consumption. Once an item is soul-bound, it is effectively consumed, becoming something like a glorified glyph with a visual effect when active. The fact that consumption needs to be controlled if you want to be a successful goblin is obvious. I keep my refrigerator almost empty, so I won't have to throw the food away. My all possessions (except for books) can be kept in a 50 cm3 box. With that said, I own an apartment and have a decent job, so it's not that I can't afford to buy more. I just don't see any point in that. In WoW though my virtual possessions take far more space, as I like to keep nostalgic stuff like tier gear from vanilla content. In real life nostalgic stuff is kept in my head in the form of memories. That is the complete opposite conclusion an asocial person would come to. People are a means to an end, right? Who cares what happens after you personally die? What difference is there between being beholden to the whims of your descendants and being beholden to your peers? If you define asocial-ness as something other than some form of solipsism, it might be important to codify what exactly that is. If the argument is that you personally will be happier with less, fine, make that argument. But the argument that people that aren't you will be less happy after you die because you indulged yourself in hedonistic pleasure while alive is purely a social one. The reason, why many people buy things they really don't need, is simple. The thinking: "What will my 'friends' think, if I have noticeably worse phone, car, flat, house?!". And some totally decieving advertisement mechanisms for the naives. It might be silly, but there are people, who have endebted themselves in hundreds of thousands of debt, when they bought their new cool overpriced houses during the 'boom'. The same goes for technology. They release new models of everything at such crazy rate, that it is impossible to catch up and have the 'top' stuff, unless you spend several thousands every few months. It's a cleverly designed trap. I simply don't replace any piece of technology, unless it breaks and repairs are more expensive than buying a new one. The question is when you receive a gift do you value it based on its purchase price or its depreciated price? Well in honesty when you receive a non-currency gift you value it on its use to yourself, even if that use is to meet a base desire. In itself that statement agrees with your theory of don't buy anything you wont use later. I think however, that both statements are wrong. When receiving a gift you should look at whether it was intended to meet an supposed requirement, as that shows understanding and kinship. In the same way when you make a purchase you should buy things based on supposed future requirement, and it is a good purchase whether in reality it is required or not. The wacky thing is that some people find that buying things makes them happier. Not showing them to other people, just going out and .... buying. I think it's part of the whole consumerism thing. So maybe it's not enough to be asocial, you also need to be minimalist? What kills exchange value (use value remains the same) is paying retail price. If you buy your shirt at the second-hand shop or buy a used car instead of new, you can avoid the biggest depreciation hit. If you want to resell it a month later, you probably haven't lost any money. The WoW economy is missing a used-goods market because so many valuable things are soulbound. There's a retail shop where you pay a lot for new goods and there's a vendor who will buy your goods for pennies on the dollar. But "soulbinding" means there is no player-to-player market (e.g., craigslist) where you can sell last tier's gear to other players for something between the vendor prices. The AH is mostly full of consumables and found items, all of which are essentially New in Box. I think Blizzard should give players a way to immortalize deleted characters of max. level. There should be in-game graveyards with haunted nearby areas. If you delete max. level character, you can put a Eulogy on your gravestone, and you can elect to have that player's spirit wander the haunted area. If nothing else, it would add replay value for people who want to become immortal and then start at level 1 again.